Denon AVR-2113 review | What Hi-Fi? A home cinema amplifier can be an intimidating beast. Even at this price point, these multi-functional machines tend to drip from head to toe in connections and sockets. Not only are they capable of simple surround sound, they’re also equipped with extra audio and video processing, as well as various methods of music streaming. So the last thing you want is a machine that complicates matters. 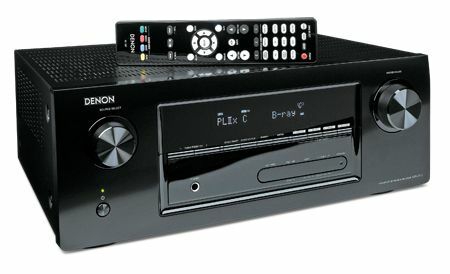 And this is why the Denon AVR-2113 should be applauded, even before you’ve had a chance to test its sonic credentials. Switch it on and an automatic setup assistant jumps into life. It starts by highlighting the bits and bobs you get in the box and those you‘ll need to buy separately. You’re then taken on a journey which gives comprehensive directions on how to connect your kit, and finally you’re guided through the Audyssey speaker calibration system. The on-screen menus are welcoming and extremely easy to follow, and the whole process of operation is aided by the simplest of remote controls. Only the most relevant buttons have been included – it can actually take your eyes and thumbs a little while to get used to such a stripped down wand. Complex tasks such as navigating and streaming internet radio stations is easy, with large on-screen menus showing all sorts of useful information, including the file format and bitrate of the streamed station. Our first experience of Denon’s control app (right) is a rewarding one. The prominent cool blue-and-black icons look smart and hint at easy operation. You can customise the home screen for the sources you’re using, and there’s a remote icon which presents a D-pad for trawling menus. It doesn’t quite have the slickness of the Pioneer equivalent, but it’s not far off. While it’s a doddle to use, the AVR-2113 is also an entertaining listen, both in surround sound and stereo. The amp sounds bolder than previous Denons we’ve heard at this price, and much more confident in its steering of effects. During X-Men: First Class, as Azazel abducts CIA agents and drops them from the sky, screams resonate between channels to fine effect and, as bodies hit the floor, effects sound weighty and precise. Dialogue between the X-Men sounds crystal clear and sits nicely in a solid, cohesive soundstage. Some rival machines immerse you deeper in the action and boast a greater all-round sense of finesse, but the Denon is still a very entertaining listen. Stream music wirelessly using the amp’s built-in AirPlay feature and tracks sound lively and engaging. During Lana Del Ray’s Video Games, her distinctive vocals come through loud and clear. What's more, Denon has now issued a free firmware upgrade for this model which adds Spotify music streaming to the already comprehensive list of features. Denon has struggled to compete in this class for a couple of years, but the AVR-2311 is definitely a move in the right direction. It gives a great user experience and sounds good to boot.